SUPER SIMPLE!!! I have a few icing recipes to share considering the “holidays” are right around the corner! This is the easiest icing recipe possible in the world of keto. The best part about it is, it’s ALL fat and can bump up the ratio of baked goods, allowing you to make a lower ratio recipe and use the icing as the main source of fat. That is exactly what I did with the cookies pictured. I made Tiffany’s wonderful coconut flour cut out cookies that are about 2.5:1. With the icing added on the top of the cookies, I was able to bring the ratio all the way up to 3.5:1. I topped it all off with colored Truvia for sprinkles (you can also color almond flour if you want to avoid sweeteners). Please don’t laugh at my decorating… I do NOT have a steady hand for small details! The icing acts very similar to powdered sugar glaze. It is just thick enough to pipe shapes around the edges of cookies, but not so thick that it holds a shape. It sits on the cookies at room temperature great, it will not soak into the cookie… provided it’s not 90 degrees in the room! When you put it in the refrigerator it will harden up enough that you can stack the cookies without the icing smudging (thanks to the coconut oil). I hope you like this technique and it helps get your kids through the food laden holiday seasons! This can be 2g cream to 1g oil OR 2 cups cream to 1 cup oil, only the proportion of cream to oil matters, not how much you mix up at once. I recommend mixing up 20g of cream and 10g coconut oil just to see how much it “looks” like. Then you can judge how much you would want to include in your recipe. Let the cream come to room temperature. warm the coconut oil until melted but NOT hot. Mix the cream, oil and sweetener together until it is completely combined. If the mixture becomes very think and the coconut oil is lumpy, sit the bowl containing the icing into a slightly larger bowl filled with warm water. Continue to stir the icing until it is very smooth and completely incorporated. Scoop the icing into a small plastic baggie and snip a very tiny corner off. 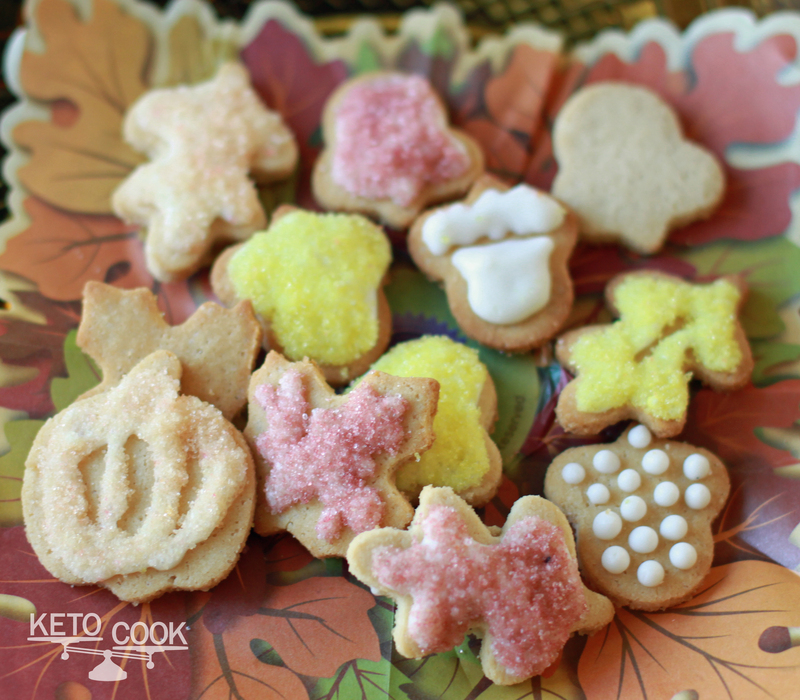 Use the baggie as a piping bag to decorate the cookies. Sprinkle the cookies with colored Truvia if desired. If the icing seems too thin, let it sit in the refrigerator for a few minutes to harden up a little. You can use any cream, but the ratio will be different depending on the amount of fat in the cream. You can also use coconut milk if you need a dairy free version. Yes, I do refrigerate most cookies, especially if they have the decorating icing made from heavy cream. I think your problem may be letting the cookies come back to room temp after storing them in the fridge. From my experience, Truvia will not dissolve in fat very well which is why it is able to sit ontop the icing made from almost 100% fat. If any moisture ( water) comes in contact with Truvia, the Truvia will dissolve immediately. It may be possible the cookies are creating their own condensation either while still in the frige (wrapped up too tightly with plastic wrap?) or while tey are warming back up. Try keeping them in the fridge, loosely covered and eating them immediately after taking them out of the fridge (that’s what happens here). Let me know if that works! I use India tree food coloring and can’t use truvia so I use organic pure sugar cane and I do let the cookies come completely to room temp and within 2 hrs after icing and putting in fridge and uncovered like u said its watery….ugh! Hi Mandi, I think the issue is the pure sugar, it dissolves very easily in water based liquids. If you need the real sugar to lower a ratio, than I would just try using the decorating sugar that is already colored. It may hold up a little better for you, other than that, I really don’t know how to help since I have never tried with real sugar! Here is a link to the India Tree Decorating Sugars. They use food based colorants, it might be worth a try! Don’t get them confused with other sugars from India Tree, they must say “Natures Colors” on them. Hi chau, so sorry I didn’t see this comment! Yes, the icing can be very temperature sensitive. The coconut oil will melt above 75 degrees, so a nice warm 98 degree hand will warm it pretty quickly! I like to use syringes for this recipe when I am decorating, I’m not actually holding it as close to my skin. I also just do a “glaze” by pouring it over whatever I have, that is much quicker! Dawn, brilliant again! I think your icing is brilliant- I don’t see the problem! do you know anyone that has tried it with coconut milk? I have do it dairy free, so it will be interesting. Yes, you can use coconut milk. The ratio will be slightly lower. I did try it with the coconut milk, it tastes very good! Since my son cannot tolerate coconut oil, can you recommend a substitute? Not sure if any oil would work as well… perhaps shortening or butter? Thanks! Hi Lori, I have not tried shortening or butter, but I think shortening would be a good choice to try. The most important part is to make sure the two ingredients are completely combined. If you try this, please comment again to let me know how it turns out. Good luck!